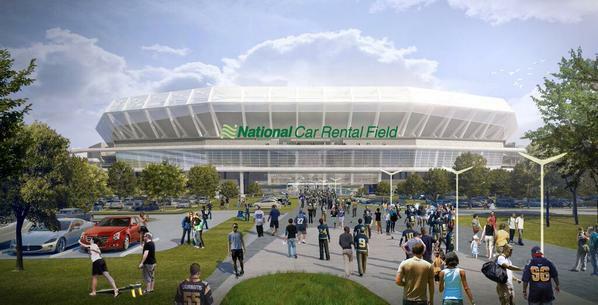 The proposed riverfront stadium may not have a team to play in it, but it does have a name: National Car Rental Field. And you know that Twitter users had a few things to say about the new name. From "Who cares, just build it"
@GondolliFloyd @davidhunn for $186 million they can put flowers around it for all I care and I would still go watch the Rams play in STL. @saraholmesSTL @davidhunn @floodmixed I don't care what they name it as long as it's built. This is good news. I could be okay with National Car Rental Stadium. Why not? @jthom1 @davidhunn National Car Rental Field? Worse name than Talking Stick Resort Arena. @publiceyestl @davidhunn @jstriebel22 If it was stadium and not field we could call it "Nat-Stat". But I'm just happy they got this deal. @jthom1 @davidhunn huge commitment by a St. Louis corporation. Shoots holes in SK's claim questioning corporate commitment. NATIONAL CAR RENTAL FIELD??? Come on St Louis, you can come up with a worse name for your new stadium than that! Then again, probably not. @stltoday @davidhunn . ...because everything more awkward sounding was already taken. @jthom1 @davidhunn sounds like a minor league baseball stadium. To "stadium shouldn't be built anyway"
Adding insult to injury: Destroying local history with taxpayer money, and then calling the mess "National Car Rental Field." How absurd. I don't hate "National Car Rental Field", but it does seem like "Enterprise Field" would have been a better EHI branded name.